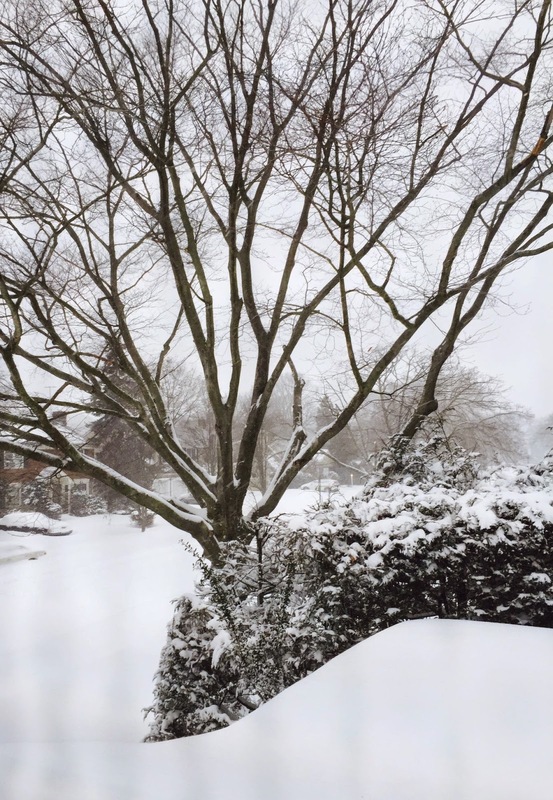 With the arrival of the snowstorm of 2015, Long Island saw record amounts of snow this January. Schools were closed for one-two days this week leading to children's gleeful noises heard throughout the neighborhood. Twice this week, I observed my little neighbors creating their own tiny hill of snow to sled down. Each time I watched them playing in the snow despite the cold weather, I thought children appear to be resilient to weather changes. Their imaginative spirit reminded me of the snow forts that my sister and I created when were small. 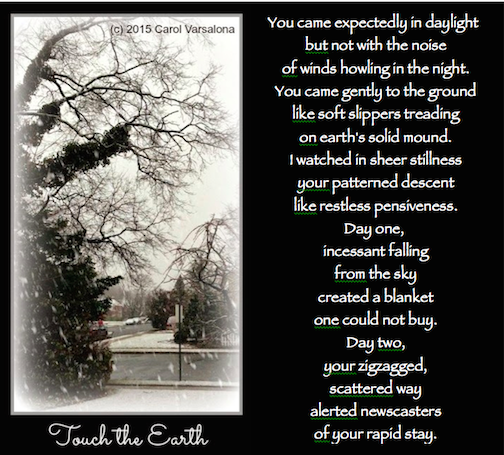 This January, Michelle Heidenrich Barnes created another challenge, a "deeper wisdom" poem modeled on Joy Sidman's What Do the Trees Know? from WINTER BEES. Thinking about the shovel that was used many times this week by my son and the two little girls' imaginative snow fun, I created this short poem. I must admit that creating a "deeper wisdom" poem is not an easy one to craft. Here is my humble attempt. As you can see, the snowstorm provided me with many ideas to write about while building a positive stance on the winter season. 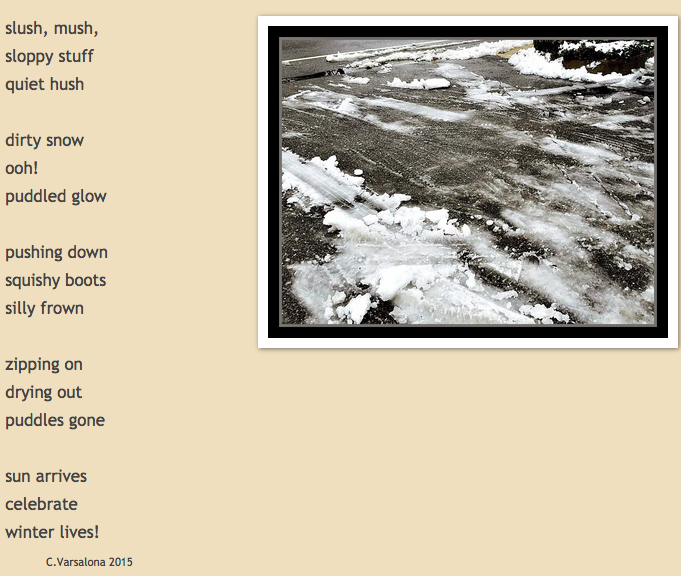 A poem about the slushy side of snow made its appearance last Saturday for Celebrate This Week with Ruth Ayres. Now stroll over to These Four Corners where Paul Hankins is hosting Poetry Friday. Enjoy the various offerings of the week. to look upon the cross. Stillness calls you to cope. to hear Him. He is near. as fears fly out of sight. that shackled you last night. 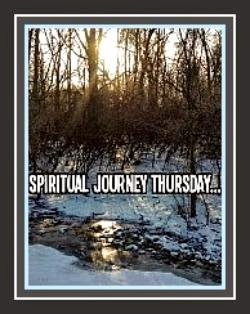 Now turn your eyes Spiritual Journey Thursday created by Holly Mueller. Each Thursday, Holly and the faithful community of bloggers come together to pause, reflect, and write on a topic. January and February's blogs are devoted to each blogger's one little word journeys, starting with Holly's word, focus. 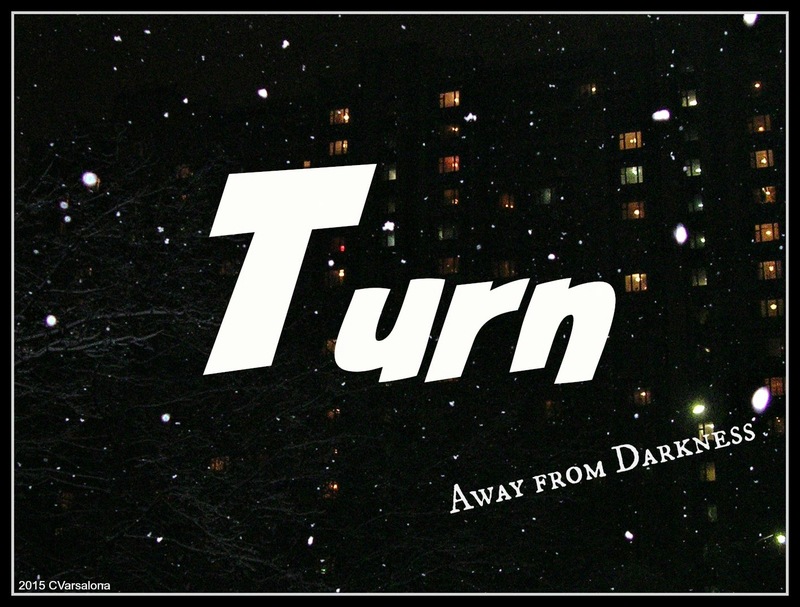 We have covered my OLW, listen, Michelle Haseltine's word, fly, and now Leigh Ann Eck's word, turn. I thank Holly for her guidance in choosing "just right" topics and bringing this community together. I am grateful for our connections and hope others are drawn closer to their spiritual journeys. There is a strange calmness in the air as we go about the routines of life here on Long Island. The sun shines brightly and the temperature seems too mild for the unexpected. I look around and think that it appears to be too peaceful for extreme weather predictions to hover over Long Island. Newscaster announcements keep on airing. Shoppers scurry to the grocery store. My husband brings home news of customers in large groups searching shelves for milk and bread and meteorologists continue their coverage of what is purported to be a historic storm. Verbs like slam and brace are thrown out as actions to be expected. 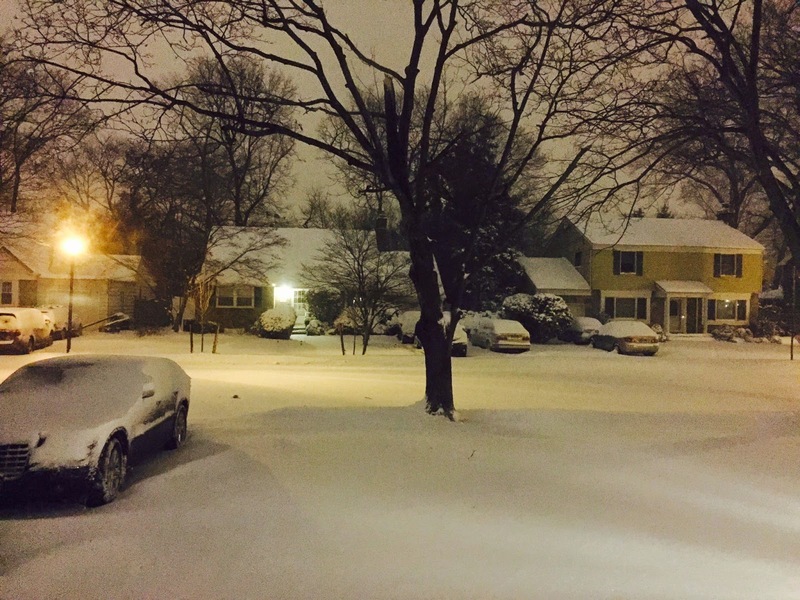 Will the Northeast be crippled by the Blizzard of 2015? All I can do is wait to see if life will be halted by raging winds of 50 miles per hour and snow drifts of 24-36 inches in height. If so, then the regional professional development event that I am to facilitate will be postponed. Everything is uncertain. This speaks to the fact that life is fragile and changeable. I wake to a coldness in the house. TV newsmen seem to be avidly tracking a storm that could stop the usual flow of life on Long Island. Their smiles make me believe that storm tracking is an engaging and invigorating sport. As the snow starts its descent, I turn my gaze out from my master bathroom window to start a conversation with the snow. as you zip here and there. horizontally in front of me. What message do you bring me? An expected email is sent out: regional professional development meeting with keynote speakers from outside Long Island is canceled due to the impending storm to be rescheduled. Are you getting ready to blast? in every corner of life. School closings across Long Island are the news of the morning along with the temperatures and footage of snow. The song, Hazy Shade of Winter, allows for a bit of positivity this morning. It reminds us to hang on to our hopes and look for possibilities when viewing the "hazy shade of winter" sky. Perhaps, today is the day for those in the northeast and other parts of the country to sit quietly, listen to the sounds of winter while shoveling the fresh snow, and "hunker down" with a pen in hand to write what winter is whispering. If interested in letting your voice fly for a global gallery of artistic expressions, Winter Whisperings Gallery, read here or here. I hope that my Slice of Life chronicling the Blizzard of 2015 gives you some insight into my noticings and wonderings during the storm. Please visit Two Writing Teachers where you will find other bloggers perspectives on their Slice of Life. Today, I celebrate the often not applauded parts of winter since positivity is my framework this season. 1. Poetry writing is the relaxer when days seem daunted by weather. 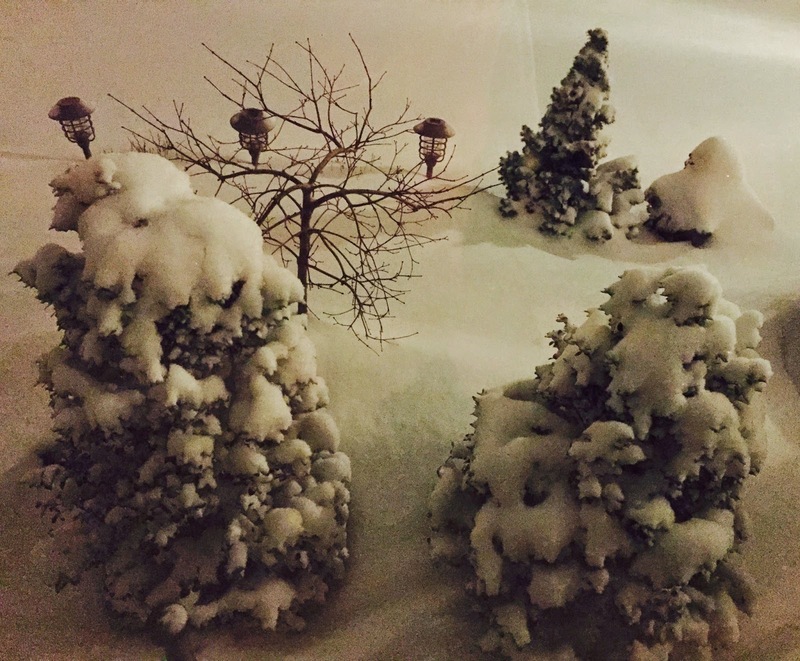 Friday, I woke in the middle of the night to see a beautiful blanket of snow outside my window. When I finally rose for the day, the snow looked smooshy. 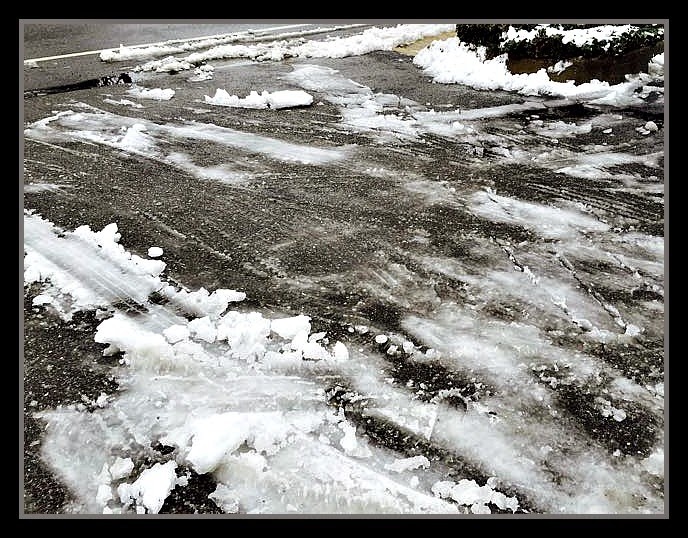 Knowing that it would not go away without a push, I asked my son to shovel. An hour later, the snow turned to slush. When trying to get into the car, I noticed many puddles of which I had to cross. Too bad, I miscalculated. I celebrate that there wasn't any more snow with traces of black ice since last week I took a flying leap as I exited the house. 2. Outdoor decorations although beautiful for the holiday need to be placed carefully in boxes for next year. Then, there is a period that no decorations grace my porch. I celebrate the long awaited finishing touches to my new wreath and the decorations for the front porch. Check out the greeting on the wreath. 3. Indoors Christmas decorations are slowly making their way into the labeled boxes. 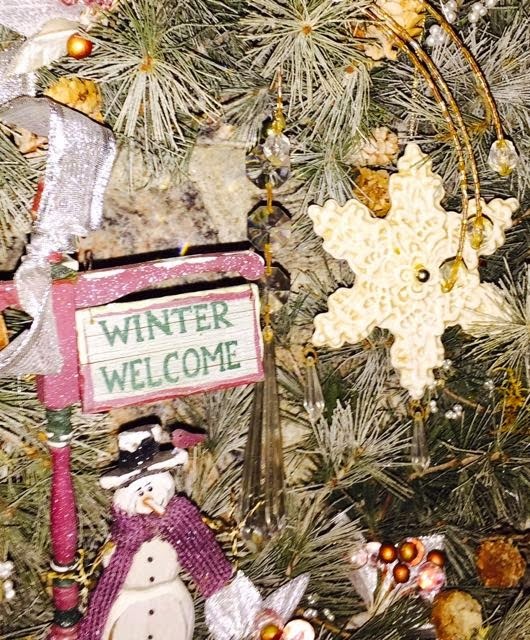 I celebrate the slow gathering and organization of decorations to make way for my welcoming winter decorations. 4. Long days of preparing and presenting professional development left little time for pleasurable activities, but I have to celebrate weekends. I celebrate the behind the scenes, often not applauded parts of winter. If you are welcoming winter this year and would like to write a poem combined with a photo of winter, I will include it in the Winter Whisperings Gallery. Ruth Ayres invites us each week to celebrate life. Click over to her site, Discover, Play, Build to read more celebration stories. When I saw a tweet about Poetry At Work Day I was intrigued. I decided to check out the site, #poetryatworkday, and the fun. The quote that I found there set my thoughts in motion (see below). I would venture that many people do not bring poetry to work. But why not? Poetry is the soul's thoughts that can take flight to make a public appearance. Why shouldn't poems be shared in places other than classrooms? During the course of a work day, many people do not think about poetry even though poems can be short, inspiring, motivational starters to the morning. Quotes are often pinned to bulletin boards of lounges and cubicle spaces, so why not poems? Poetry can be the chat around the water cooler or make the email trail so to honor the work force, I tinkered with the haiku form. In its brevity, it makes me think. It also surprises. After several drafts, I settled on the one below for #poetryatworkday. 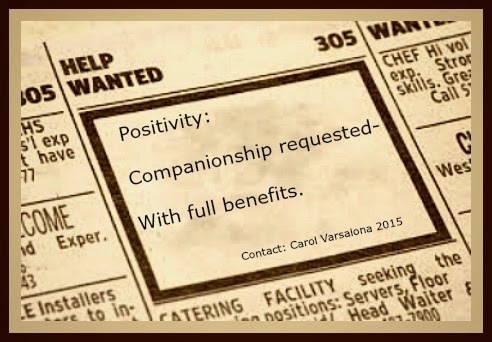 The intent of my poem was to bring a light touch to the help wanted ads as an attractive lure for job seekers interested in positive thinking. I hope you find it light-hearted and fun. 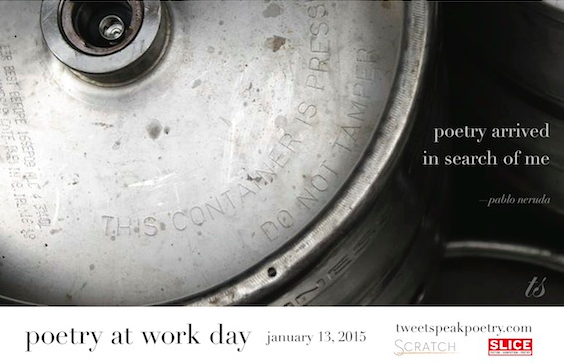 After submitting my haiku via Tweeter, I was surprised to find that it was among those featured for #poetryatworkday. I credit my entry due to Violet Nesdoly's post that inspired me to take a look at what the site offered. (Thanks, Violet.) Unfortunately, I cannot find the tweet from #poetryatworkday about my haiku but the pleasure of being recognized still brings a smile to my face. Now, please stroll over to A Teaching Life where my friend, Tara Smith, hosted Poetry Friday yesterday. Although I am a day late, I joyfully offer my haiku for comments. There are many delightful posts to read this week, so relax and enjoy. I have never been a dare devil who longs to glide across the ocean, fly an airplane, or jump out of one, but the thought of letting my spirit fly is very appealing. I often feel a rush when creativity sparks. Words leap forth, spin, and cascade gently to lay in the arms of a poem, an artistic saying, or a piece of prose. Their flight is launched from deep within, stretching across the wide expanse of the mind. The fleeting nature of creative thought flickers in space. I strive to focus and listen daily for its calling, pushing the limits of my daily writing as the Divine Spirit guides my hand. Is it the gift of faith that allows my words to take flight? I like to think so. With deep regard for the words of the Spirit, I focus on this line from Psalm 18:10. Words have wings like an eagle. courage unlike the cowardly lion, and possibilities like our endless, spiritual journeys. Let them fly today and every day as a recognition of the Lord's lasting gifts to us. As you seek the Lord's wisdom, focus on faith to let your words fly . After listening to this contemporary Christian song, turn your attention to Holly Mueller's Spiritual Journey Thursday site where she and the faithful community of bloggers come together to pause, reflect, and write on a topic. January and February's blogs are devoted to each blogger's one little word journeys, starting with Holly's word, focus. My OLW, listen, was the topic last week. Fly, this week's topic is Michelle Haseltine's word. I thank Holly for her guidance in choosing "just right" topics and bringing this community together. I am grateful for our connections and hope others are drawn closer to their spiritual journeys. January is thought by many to be the month for dreamers. It is the start of the new year so naturally we dream big. Resolutions, one little word to guide your thinking, and nerdultions are the topics during the first two weeks of January. Fans dream of their teams being superstars and their movie stars becoming A-list contenders. Travelers in the northeast dream of warm-weather travels, and the list of dreamers doing what dreamers do goes on. As I sit reflecting on the movie, Selma, that stirred strong emotions inside me and the words of Martin Luther King's I Have a Dream speech, I flip through my posts from last year. I find a quote in a previous post that resonates with me. 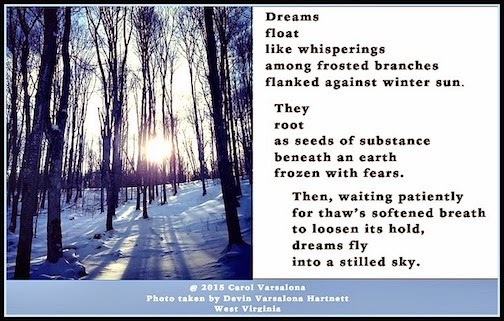 So to keep with the tradition of dreaming big, I penned a poem based on a photograph my daughter posted while skiing in West Virginia. Now, I read it aloud while listening to the call of winter. At just what point in January do we recognize that our dreams can become something more than an abstract notion? When do we step outside the dream to be proactive in its pursuit? When do our dreams fly toward fulfillment? Martin Luther King, Jr. had a dream. He actively pursued his dream of equality and justice through peaceful protest. Unfortunately, his life was cut off before his dream was fulfilled. Now, is the time for us to reflect on where we stand on the fulfillment of our dreams? The winter season allows us to slow down a bit and savor the moments, while planning our next steps. The ultimate dream maker, Walt Disney, said, "All of our dreams can come true, if we have the courage to pursue them." January is the month for dreamers and February the month for doers. Are you ready to pursue your dreams, continue your resolutions, one little words, and nerdlutions in pursuit of your dream? You might enjoy listening to the following soothing piano music while you dream this January. The call of winter is calling me to create and act upon my dreams and passions. Will winter call your to move forward? This slice of life comes to you today. On Tuesday, you can find the musings of other slicers at Two Writing Teachers. Enjoy the slices that speak of small moments in our lives. Winter is a season that can bring the warmth of a fireplace, the glow of the sun, and the freshness of crisp air into our hearts. It is a time to step back, reflect on our ordinary weeks to find the celebrations that exist. Stories evolve from these reflections. At the Celebrate This Week site created by Ruth Ayres, bloggers write to celebrate personal and professional stories that shed light on the positive aspects of life. Our stories offer a glimpse of life and learning through our struggles and successes. At times, life's tasks interfere with personal reflection time. When this occurs, we need to respect our responsibilities, wait, and LISTEN (my OLW) for the voice inside that says it is time to celebrate. I celebrate positivity this week as an antidote to what I used to call the winter blues. As I took down the outside Christmas decorations (a bit overdue) in the cold this afternoon, the sun was shining. I noted to my son that I would truly welcome winter into my life this year. He shrugged and said his usual retort, "It's too cold here." To honor my positive attitude toward winter, I created a background of blue on my Tweeter site. With this in place, I can shed the winter blues' attitude to create a framework for positivity in 2015. I am ready to take on what used to be considered by me the burdens of winter. A calling to LISTEN to winter's whisperings will inspire me to write and hopefully impact others' thoughts. and shine forth in drizzling rain. See winter's blush and smile. Today, I celebrate the winter whisperings that are being sent to me for my upcoming global gallery of artistic expressions from those around the globe. You can find out more about how to offer your musings on the season of winter here and here. Let's connect, celebrate winter, and remember that there are untold stories about the season that will shed a positive light from the winter sun. With each story that unfolds you can: Help me find the perfect swatch to color a world of winter watch. Ruth Ayres invites us each week to celebrate life. Click over to her site, Discover. Play. Build. to read more celebrations. My positive approach to this year's winter season, is quit a departure from years past. I am taking on the watch, listen, and learn attitude as the weather conditions go from blustery and too cold for walking to less cold. During the storm that hit many states, I watched the snow fall for two days and listened to whatever sounds came my way. Eager to write about what I witnessed, I learned to be patient with my words. They needed some prompting to circle the scene I watched outside. Then, slowly they appeared, ready to descend on paper as fresh as the new fallen snow. The photo below does not do justice to the dancing pattern of the snowflakes I witnessed, but it will suffice. The poem nestled next to the image, still needs to be refined. Both are as rough as the jagged rocks in the garden covered by a blanket of white. But isn't that what writing is all about-taking a piece and crafting it, and then refining into a little gem of merit? There is more to this poem but it just isn't public ready so the ending will have to wait until winter whispers to me again. 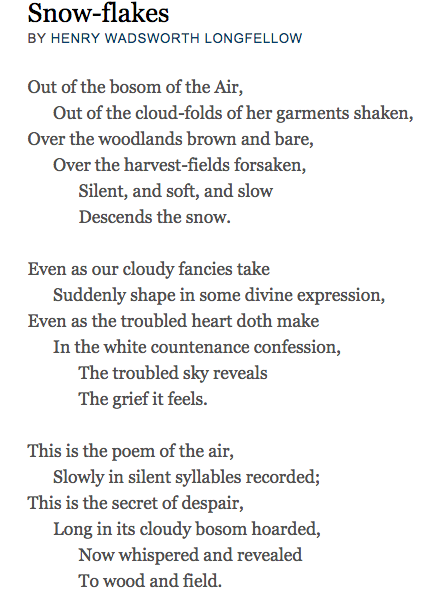 And now to hear Longfellow's whisperings of winter. I humbly offer my own writing next to Longfellow's to illustrate the difference between a master and an apprentice. Comments from fellow Poetry Friday members on how to refine my thoughts would be greatly appreciated. Poetry Friday is here to bring good cheer at the beginning of the year. So stroll over to Irene Latham's Live Your Poem site for the MLK edition of Poetry Friday. Irene is sharing two poems from the Cybils finalist VOICES FROM THE MARCH ON WASHINGTON ON WASHINGTON, Poems by J. Patrick Lewis and George Ella Lyon, and an original poem hewn from the Dr. Martin Luther King, Jr.'s I Have A Dream speech. If you LISTEN in stillness, your ears will allow you to hear what silence is saying. The voice sometimes arrives as a warm calling in the darkness, brightening your surrounding space. At times, you may not understand the words that appear in the corners of your mind. Other times, you may not hear for your heart is blocked. When you are on the edge, the voice calls you back in, opening the passageway to possibility. All you need to do is LISTEN. From the voice of experience, I write, for I have been in every situation described above. Those life lessons have led me down twists and turns to the place called now where I am committed to LISTEN intently each day. 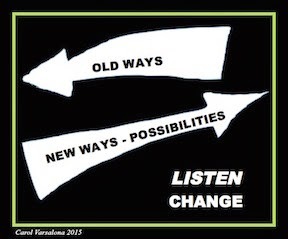 Discarding old ways and making way for new ones will happen if I just LISTEN. With faith and positivity at the center, hope in my heart, and possibilities on the horizon, I know that I can change the direction of my journey. Let your ears listen to wisdom. Call out for the ability to be wise. Look for it as you would look for silver. Search for it as you would search for hidden treasure. Then, you will understand how to have respect for the Lord. You will find out how to know God. 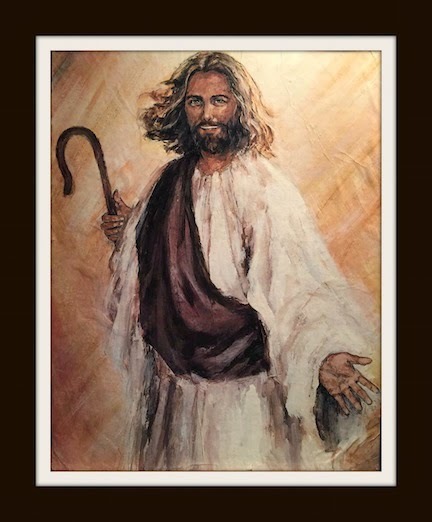 While visiting friends last weekend, I noticed a striking painting and stopped to admire the detail and the radiance emanating from the face of Jesus. It seemed odd that the photo never captured my heart before. Perhaps, it did not because now is the right timing for old ways of observation to make way for new possibilities. As I continued staring at the painting, my friend, Judi, told me that the painting was the work of Beth Seigard, a skillful national artist, living in Auburn, Washington. Because the painting is so memorable and it exudes warmth, it proudly graces this blog site as an invitation to Pause-Observe-Listen to your heart. I did pause to take a closer look at the painting before capturing it digitally. When I returned home, I reflected and continued to read various texts that allowed me to ponder the immensity of the word LISTEN. Finally, a voice broke through the stillness, spoke to me, and allowed this poem to evolve. I am the Light in the Darkness! Take a moment to listen to Still Listening by Steve Curtis Chapman. His song honors the Lord who knows all our hopes and all our fears. After listening to this soothing song, turn your attention to Holly Mueller's Spiritual Journey site where she and our faithful community of bloggers look forward to Thursdays. At this site we allow the reader insight into our spiritual journeys with hopes that you will join us and listen to our hearts. Below you will find the focus for the January and February Spiritual Journey blogs. I took the liberty of allowing each of my fellow bloggers' OLW to rest gently in a poem for I am listening to their words so they can shed light on mine. I thank Holly for featuring my OLW, LISTEN, for my fellow bloggers to offer their perspectives and I look forward to reading all of their texts.